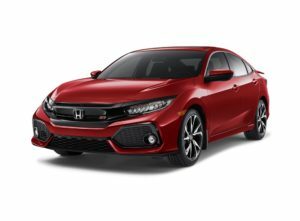 Contact us at Alberta Honda, your Honda Edmonton dealership, for more information on the 2019 Honda Civic or to book a test drive. Every Honda is made from love—carefully crafted, from the inside out with the purpose of creating automotive excellence. 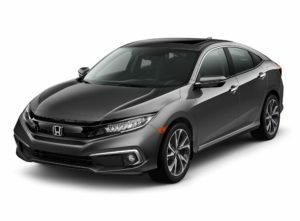 The 2019 Honda Civic is no different! A classic name in the Canadian automotive industry—for decades the Civic has been one of the most popular sedans on Edmonton roads, because it exemplifies efficiency, reliability and of course, value. Starting at $17,790, the Civic is one of the most accessible cars on the market. The 2019 model has a fresh design, updated features and remarkable innovation. No vehicle lives and breathes the Honda brand more cohesively, than the Honda Civic. Read on with us at Alberta Honda as we dive into the specifications and features of this compact car. On the outside, the 2019 Honda Civic has been restyled for a more charming look than ever before. A restyled front bumper puts the Civic in an aggressive stance and sleek lines that run through its entire body. For 2019, Honda has also brought to life a new Sport trim for an even more assertive presence with a bold exhaust finisher, gloss black trim and decklid spoiler. And even though the Honda Civic is a compact vehicle, many people don’t know how spacious it is. It’s a vehicle capable of carrying all your belongings and passengers comfortably thanks to its maximum interior cargo volume of 428 L which is more than any other vehicle in its class. The optional infotainment interface has also been updated for more fun, adding a volume knob for practicality. From behind the steering wheel, you get that classic Civic feeling, a feeling of total control! The 2019 Honda Civic is definitely not your typical compact sedan! The 2.0 L 16-valve, Port Injection, DOHC, i-VTEC® 4-cylinder engine, in the DX, LX, EX, and Sport models produces a horsepower of 158 and 138 lb-ft of torque. If you want more power, opt for the Touring or the Si trims and receive a 1.5 L, 16-valve, Direct Injection, DOHC, turbocharged 4-cylinder engine that delivers a horsepower of 174 and 162 lb-ft of torque. r When it comes to fuel economy, the Honda Civic does not disappoint. The 2.0 L i-VTEC® 4-cylinder engine has a fuel efficiency rating of 9.3 L/100 km in the city and 6.5 L/100 km on the highway while its turbocharged 1.5 L alternative offers 8.4 L/100 km in the city and 6.2 8.4 L/100 km on the highway.